Ronthil is a Bosmer vampire living in Volkihar Keep. He is an assistant to Feran Sadri. He has a store and is an expert trainer in Speech. He wears a set of red colored vampire armor with a matching pair of boots. He is equipped with a leveled one-handed weapon, and carries random leveled bandit items, as well as a 25% chance of carrying 1-9 gold. He knows three leveled Destruction spells along with Drain Life and Vampiric Invisibility. Like most vampires, he is subject to the vulnerabilities and resistances associated with vampirism. When you enter Volkihar Keep for the first time during Bloodline, attempting conversation with Ronthil will have him say, "No, no. You must speak with Lord Harkon, not me!" in annoyance. Afterwards, he will be more welcoming, as he will tell you, "I hope you find life in the castle to be to your liking." when you pass by. He will also muse, "It is good to have powerful allies, is it not?" At other times, he will mention Feran Sadri: "Feran is so good to me, allowing me to be his assistant." If you are in vampire lord form, Ronthil will remark, "I hope you're not trying to lord your abilities over me." He will bid you farewell with the words "I look forward to our next meeting. ", "Thank you. I'll be going." or "Good hunting." When asked what he does here, he will answer, "Whatever is required! I am happy to do whatever is asked of me. I only wish to be useful. Often I take on tasks that Garan or Feran find distasteful, or... beneath them. If I can remain useful, those above me will see fit to keep me here." Before you trade with him, he will often mention his eagerness to serve, saying one of the following: "I am more than happy to buy or sell whatever you might need. ", "I'm sorry I don't have more to offer. ", "I hope I have something that interests you. I always wish to be of service. ", "You need something? I am happy to help, if I can. ", or "I've scrounged up a few things. Here, please, take a look." If asked for training, he will likewise reply, "Of course! It is my duty to serve, and I am happy to do it!" However, if your Speech skill is at least 75, he will instead tell you, "I am afraid you're beyond my meager abiliities [sic]. I am sorry I cannot serve you better." Ronthil: "Do you... do you need anything, Feran?" Ronthil: "Can I assist you? You know I live to serve." Feran: "No, I don't need anything right now. Please stop asking." Feran: "Ronthil, where is the last batch of alchemy ingredients I asked you for?" Ronthil: "Ah, yes. That. There were... well, complications." Feran: "I don't want to hear about it. I want what I asked for." Ronthil: "Yes, Feran. Of course. I'll see to it." Ronthil: "Vingalmo, is there... can I do anything for you?" Vingalmo: "I don't recall addressing you, worm." Ronthil: "No, I just... I thought perhaps..."
Vingalmo: "In the unlikely event that I ever require you for some reason, I shall find you. Until then I see no reason for us to be speaking." Ronthil: "Very good. I'll just... I'll be going now." Ronthil is a member of the bard class, which determines the level of his skills. Unlike the other members of the clan, Ronthil doesn't rest in a coffin. Instead, he can be found sleeping behind the corner bookshelf in the castle's study. During Bloodline when you enter Volkihar Keep for the first time, Ronthil is standing on the balcony overlooking the dining room. There is a brief window before Lord Harkon addresses your character directly. During this window, all the residents of Volkihar Keep will be friendly and interact with your character normally. With good timing, you can stand on the dining table, jump toward the balcony and initiate dialogue with Ronthil, before Lord Harkon speaks to you. This will allow you to purchase Heal Undead, which is ordinarily impossible if you choose to side with the Dawnguard. 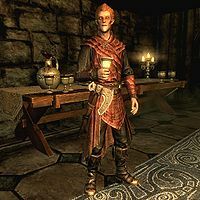 Ronthil is the only vampiric Bosmer in the entire game. This page was last modified on 3 September 2018, at 23:53.